This is a response to Betty Eadie’s best-selling book Embraced by the Light, a supposed near death experience that has generated new interest in such things. Groothuis says, ‘‘Not all spiritual experiences are safe or dependable. Spiritual deception is far from rare. If we do not discern and reject deceptive claims to the truth, we will become ensnared in error and mistake darkness for light. It is only by knowing and adhering to the truth of God’s Word that we, like Jesus, can discern when the demonic is inducing or influencing spiritual experiences.’’ In discerning why people long for such experiences Groothuis concludes, ‘‘My burden in writing this study of near death experiences has been to caution fellow mortals about their prospects for immortality. We are all exiled from Eden and yearning for heaven. But yearning for heaven is not the same as possessing it, wishing does not make it so. 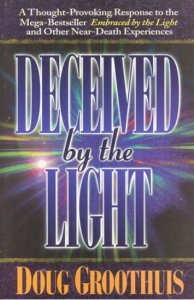 Some people may have been deceived by the light.’’ The author takes pains to investigate near death experiences and evaluate them according to scripture. Alternative suggestions are given as to why people think they have left their body when they may not have at all.